In late 1956 when the Reverend Willard Reeves, Director of Church Extensions for the Minneapolis Presbytery, met with a small group of interested families who were considering creating a new church in the St. Louis Park area. The first meetings were held in homes of various members and a steering committee was formed to make the necessary preparations. 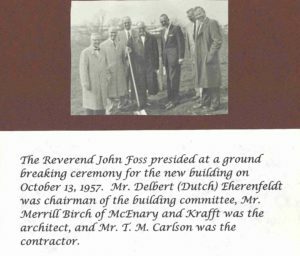 In January and February 1957, the first worship services were conducted by The Reverend John Foss in Eliot School on Hampshire Avenue and Cedar Lake Road. We soon outgrew the audio-visual surroundings and found ourselves amidst athletic equipment in the gymnasium. By June 1957, Peace Church was commissioned an organized congregation by the Minneapolis Presbytery and at the time of its creation, the rolls carried the names of 157 charter members. Soon a building committee was appointed and through study and planning finally led to the firm of McEnary and Krafft as architects. The new structure would house a Sanctuary, Fellowship Hall, office’s and Christian Education space. By October 1957, ground breaking ceremonies were executed at the site on Cedar Lake Road and Quebec. The construction cost for the original building was $120,000. 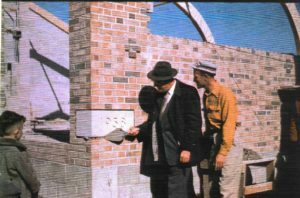 The cornerstone was placed on February 23, 1958 and the new building was officially dedicated on Sunday, October 12, 1958. On June 1, 1958 we were ready for occupancy. In the excitement a “communicant” flew in on wings – though not necessarily on those of a dove. Would you believe…a pheasant flew in through a large window to be present for worship. Many of the finishing touches were completed by members of the church. At the end of three years, we became self-supporting. 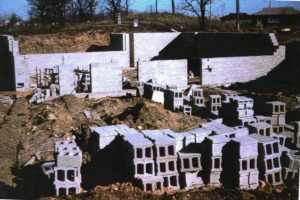 In 1960 and 1963 we expanded, and ground breaking was held on October 11, 1964. The expansion added a parlor, new offices and a library, as well as a nursery and wheel chair accessible rest room.